Nothing says “I love you” like a six inch wide entry wound. Some folks call these rounds “bolo rounds”. 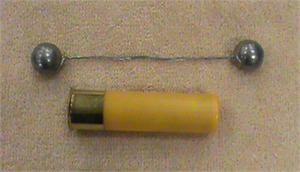 These rounds contain two .50 Caliber musket balls connected by a 6 inch seven strand, braided steel cable. While the cable keeps the balls close together in flight it makes its own wound path upon impact. You have to see this round in action to truly appreciate it. These rounds are illegal in several jurisdictions including but not limited to FL, MA, IL, HI, AK, DC and NYC. Please check your local and state laws before purchasing.